A general review of the Avian Influenza and how to prevent the spread of it. 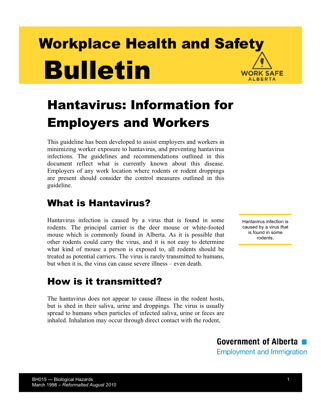 Hantavirus what is it and where does it come from? Workers in a variety of settings may be exposed to biohazardous substances that cause disease. In some instances, immunization may be recommended as one of the control measures used to prevent illness. Mould can be our friend but it also can be the cause of many issues. How do I prevent it in my workplace? Mould – Do I Have a Workplace Mould Problem? How do I know if I have a mould problem? What can I do to remove it?